Abbie Newell proffers watercraft at the new ACE Adventure Gear shop in Fayetteville, West Virginia (WV). One of West Virginia’s largest adventure resorts is investing again in the burgeoning outdoor-adventure community at Fayetteville on the New River Gorge. ACE Adventure Resort, which hosts more than 50,000 guests annually near Oak Hill, has opened a 5,500-square-foot gear store at the entrance to Fayetteville’s historic downtown — an investment that’s already enjoying returns, according to retail manager Abbie Newell. Quietly opened five weeks ago, the store on Court Street is attracting passersby as well as hikers, campers, climbers, and paddlers who are visiting the town in increasing numbers. “I think our investment here demonstrates the strength and increasing value of Fayetteville,” Newell said. The resort had maintained a gear shop on Fayette Station Road on the outskirts of town and several years ago had leased part of the present building, but, Newell says, the new, expansive store is having a greater impact than had earlier versions. 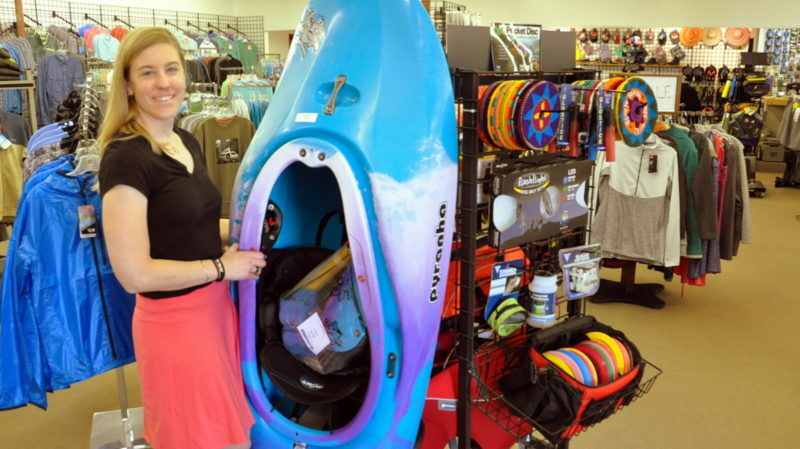 Newell said business is likely to increase as the store displays kayaks and other brightly colored watercraft outside during business hours. In addition to its proximity to hiking, climbing, and paddling in and near the region’s national parkland, the small town boasts two bike shops, a climbing-gear shop, five antiques stores, and five independent restaurants. For more information on the new shop, expanded store at 239 N. Court St. visit ACE Adventure Gear.